Fancy a tasty curry in a hurry? 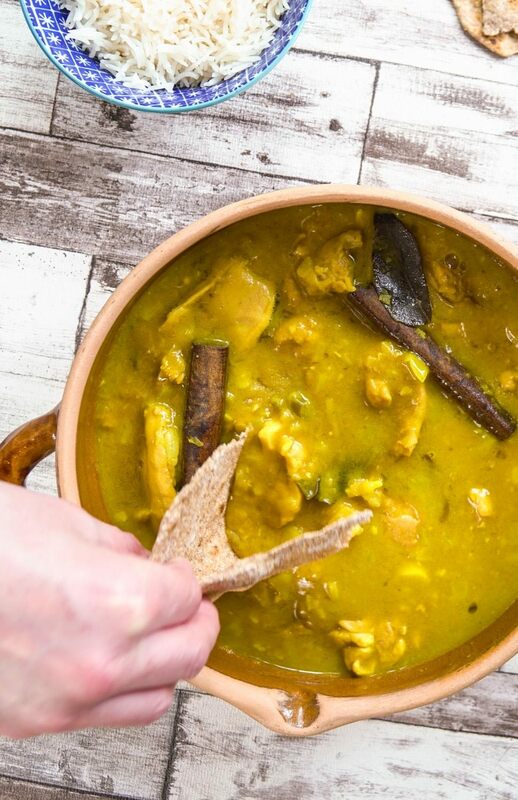 This chicken dhal curry is ready in less than an hour and is bursting with fragrant flavours. Heat a deep saucepan over a low heat. Place the red lentils in along with half each of the curry leaves, chilli, onion, garlic and ginger. Add the cinnamon stick, turmeric, curry powder and salt and give everything a good stir. Pour the coconut milk and the water into the pan and bring to the boil. Reduce the heat and simmer over a low to medium heat for 10 minutes until the lentils are soft and the mixture is thick. Stir occasionally to prevent it sticking. Add the chicken to your mixture, simmer and cover for about 20 minutes. In a separate frying pan, heat the coconut oil and add the rest of the remaining curry leaves, chilli, onion, garlic and ginger. Cook for a couple of minutes until the onion browns and the whole mixture is fragrant. Keep stirring at all times. Then tip the mixture into the dhal and give a really good stir. The curry should be about ready now, check the chicken is fully cooked. If you prefer your dhal a bit creamier, keep cooking until you have the right consistency, stirring occasionally. Serve with basmati rice and chapitis. Enjoy!